Found the following videos and pictures posted by Stephen Clyde. Thank you, Stephen, for sharing! Thank you, MaryEllen, for this beautiful picture. The following photos are credited to Deborah Georgini Beaupre! Thank you for the fantastic pics, Deborah! If anyone reading this was at the concert at the Kimmel Center, we would love to hear from you! Tell us your experience!! I thought I would include the full Il Volo Experience from our attendees Margaret, fdcunnane, Camille, and Phil! 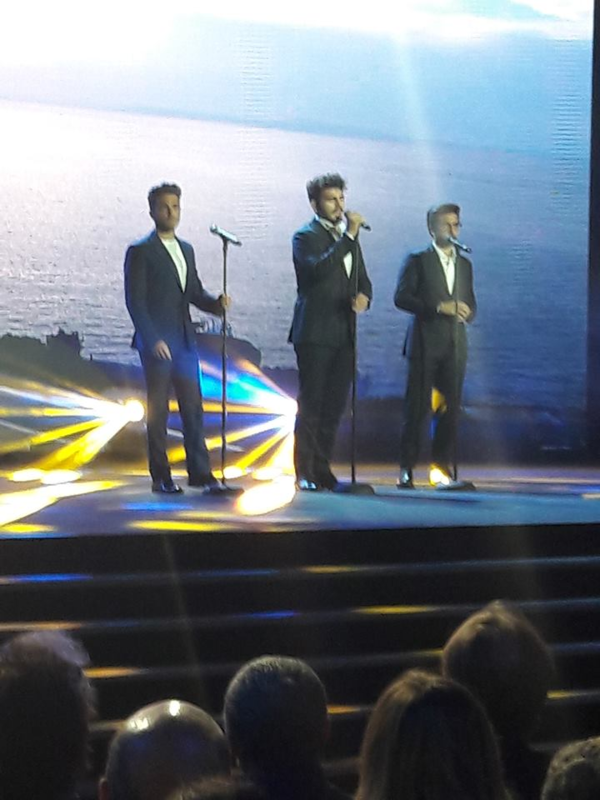 From Margaret: “I’m not sure where to begin or know if I can describe just how beautiful Il Volo’s concert was last evening. It truly was a “magical night”. I attended the concert with my son Michael. I did not have the Meet and Greet but was fortunate to get a seat in the front row in the center. 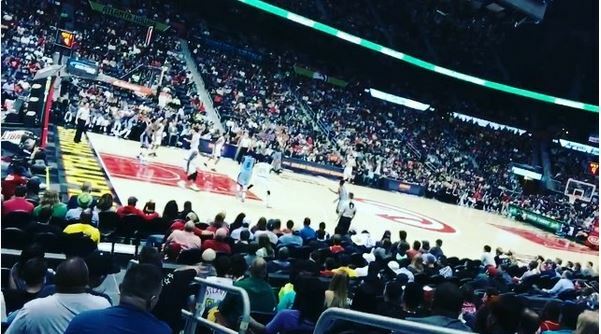 (When I ordered the tickets there was one seat available in front and one directly behind, so my son sat right behind me). I thought there would be two smaller rows of seats in the “pit” in front but someone told me they took those seats out to extend the stage since the orchestra was very large and they very good. I didn’t get the name of the Maestro but Piero mentioned that he was from Sicily. They had music stands set up slightly to the left where they would place their music just as they had in Florence. The President of the State Theatre came out and mentioned that this would be the third time Il Volo would be performing there and asked that people not take pictures or videos and to just enjoy the moments. It was very exciting looking around and seeing the theatre full of people. The orchestra came out and played the opening of their concert La Forza Destino and then Il Volo came out to tremendous applause. They were in their new suits I believe, and they looked wonderful and so happy. They began with Nessun Dorma and it was so beautiful. Their voices were better than ever before which is hard to believe. I was smiling the entire time and almost cried. I was just so happy and grateful that I was able to see and hear them and to be so close. They really followed their concert in Florence. I think it was after Ignazio sang Tonight (I had written down when they sang it but can’t find the paper), that they announced they were going to sing Ave Maria, Mater Misericordiae and it would be the first time they would be performing it live. They tried to be solemn and Piero made a blessing gesture with his hand and they kidded a bit. Gianluca said they hoped to sing it someday before Pope Francis. I was so happy they included this song and it was wonderful. As you can imagine, all the solos and duets were amazing and got tremendous applause. They would laugh and make a few jokes when one or two of them had to leave the stage for the solos and duets. I couldn’t help standing up and cheering after almost every song and many people were doing so, especially after the solos and duets. They were so happy and smiling and really appreciated seeing and hearing how much the audience loved them. I did bring some flowers since I knew I would be very close to the stage. After each of their first solos, I was able to give them to Ignazio, Gianluca and Piero. Their voices were just so powerful and they were absolutely perfect. There was a 15 minute intermission also, along with the intermezzos. They finished with another beautiful Nessun Dorma and I was able to shake hands with Ignazio and Gianluca. It was funny that as they were leaving the stage, Piero stopped to pick up their music. After much clapping, they came out again and sang an encore of I believe Libiamo Ne’ Lieti Calici. At this point my brain wasn’t functioning so well since I was so happy. From Camille: “I was at the concert in Easton last night. It was emotional and exciting when they came on stage and they were smiling and relaxed and looked so handsome in their new suits. I love my DVD and CD but to hear them sing those songs live was breathtaking – their voices were always beautiful but now that they are older they are just incredible. The duets were so moving and the part I love is when they are done singing a song they hug each other or high fives – you can truly see that they love and support each other. Piero told a story that he and Gianluca sometimes call their own brothers – not by their names but by each other’s names – but he said Ignazio calls his dog their names. They were so charming, joking with each other and the audience. You could see they were truly happy to be on stage – they received a standing ovation and bravo’s after each song. A nice surprise was they sang the new Ave Maria, which was wonderful. I did not know this but they said that it was written for them and that one day they would hope to sing it for Pope Francis. Second surprise – at the end after they sang Nessum Dorma again and took their standing ovation -they took their music books and left the stage(well actually Piero took all of the books, Gianluca and Ignazio forgot to take their books) – we thought they were done but they came back out and sang Labiamo (hope I spelled it right) – Ignazio said it was the drinking song. The orchestra was wonderful – they played alone just like in Florence – the maestro (can’t pronounce his name was very sweet – don’t know if he is with them for the entire tour or just last night. There are so many words to describe them – but for me and I know for most of us they just get into your heart. I know if I am having a bad day – just listening to them makes everything better. I wish everyone who loves them could get to see them – but for those who can’t I hope this gives you a little insight into what is is like to be there. I an also going to see them in Philadelphia and I have a meet and greet – feel so lucky that I can be there. Thank you one and all for sending in comments and photos! For those attending the next concerts, please don’t forget to send us your “experience” and photos. We will try and include as many as we possibly can and apologize if we cannot use everything. Next up! Radio City and the Rockettes! Um – I mean Il Volo! Today Il Volo was on the television show L’Arena. 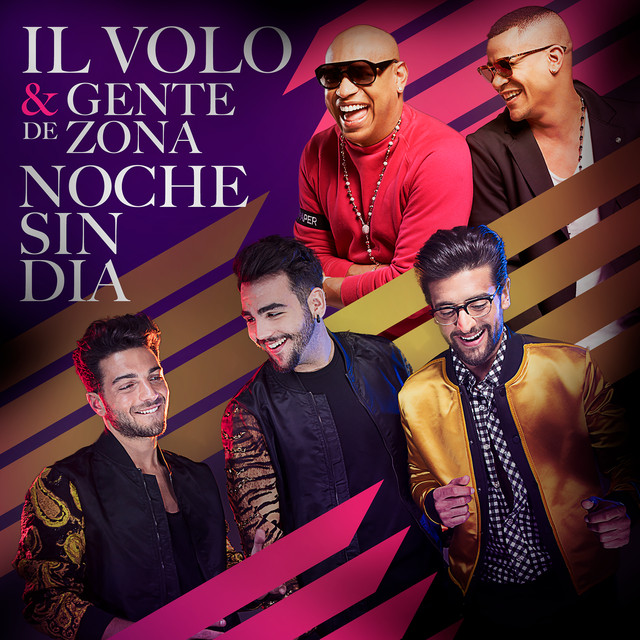 Click on the link below to watch Il Volo. Slide the counter on the bottom of the video to 1:59 where Il Volo’s interview begins. “Giletti has always been a friend of IL VOLO and after the presentation of duty, makes them sit down and begin a familiar interview. He asks if all three work the same and they make clear that they split the roles, everyone follows certain things, but Ignazio says that Piero’s what good or evil always puts his face. Giletti then introduces their band that accompanied them in three cycles of concerts and calls for non-prepared performances, as it does sometimes in the house of friends. Ignazio begins with a piece of Pino Daniele “O’ Scarrafone”. The atmosphere is very informal, even Giletti tries to sing. Then we speak of the Sanremo victory and passes a short video of the winner Gabbani this year. Gianluca says it’s a good song, but he sided with Ermal Meta, his friend, who was third. Giletti ago revise Sanremo victory of IL VOLO and is always exciting, even Ignazio says there still seems true. They admit that their notoriety from Sanremo in Italy has changed. Ignazio also said to have been shown to not only kids but people who have much to give beyond music. Piero sings a song by Cocciante “A mano a mano” . Is introduced to the subject of their “refusal to Trump” and Piero insists that a singer must have the right of choice. Thank you again, Daniela, for translating these wonderful videos and beautiful songs! As if the North American Tour approaching is not exciting enough, we have something else to look forward to. The most exciting part is that this is UNRELEASED songs, meaning new and never heard before. Could this be songs they have written themselves? Could this be songs written for them? Either way, I’m feeling Grammy in the near future! What do you think? IL VOLO NOTTE MAGICA NORTH AMERICAN TOUR 2017!! “Get ready! Just a couple more weeks until Il Volo head to Radio City for one unforgettable night! But first up is Easton, PA on March 2nd at the State Theatre! As we end summer and the weather starts cooling down (for most everyone), I thought it would be fun to step back and take a look together at summer in Il Volo land! I’m sure you have seen many of these photos before, but, really, can you not get enough? Santo Domingo – Look at the beautiful palm trees and beautiful blue sky? If anyone sees anything else that needs to be pointed out, please feel free to do so. …and a one and a two…GERONIMO! Who didn’t enjoy watching this video of Ignazio over and over (and over and over) – A man and his dog! The following pictures are of Igny and Piero who decided to vacation together with family in Taormina. Look at that beautiful sea and pool. Wait! What is that? They just love eating at BamBar in Taormina, Sicily. Doesn’t that look refreshing for a hot summer day? The dessert looks good, too! Just like a man and his dog, there’s nothing like a man with his horse! …and he paints, too! Their talents are endless! Such grace – such form! I never thought fish were handsome. This must be a new species. Piero on waterski. Such skill! I hope you enjoyed summer. So much to still look forward to as they go on tour in 2017. It’s right around the corner. I know there are more pictures but I only used pictures posted from Piero, Ignazio, and Gianluca’s Twitter/Instagram/Facebook pages. Credit goes to these three lovelies. When last I wrote, we left off was in Miami. Now for Part 2 of the North American tour!! Enjoy! After their fun in Miami, we next catch up with them in Fort Myers. Ignazio, Ignazio – where for art thou Ignazio? Here he is! It’s great that they had the opportunity to get out for some fun. Does anyone else wish they were on that bus? Just me? Gym time in New Orleans. Hanging out on the bus sporting their new Il Volo Logo T-Shirts (and never without their cellphones). Again, I ask, anyone want to be on that bus. It’s ok – shout it out!! They attended an event here. Anyone know what it was? Um – Oh yeah – FAN FAIRE!!! Last stop – California here we come! Piero says Hollywood is always a great place to perform. I absolutely agree. Must have seen Soonie while they were there. Notice Piero’s buzz cut on the sides? Getting in some exercise in Santa Monica. Love this! Gianluca loves California. It truly is a beautiful state and it certainly agrees with them. Alas, the North American tour comes to an end. Until we meet again!